Have you ever wanted more from the Christmas season? 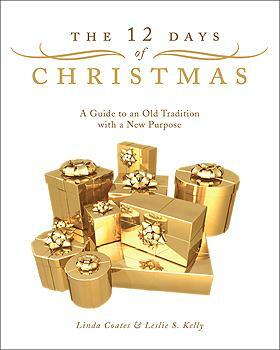 The 12 Days of Christmas is more than just another Christmas book. It is a way to recapture what has been lost in the hustle and bustle of Christmas so that this year it can be different. This inspiring book will help you discover that Christmas Day is the jumping point for the real celebration, not the final affair. The twelve-day adventure begins on December 26. Authors Linda Coates and Leslie S. Kelly shed new light on the hidden meanings in the old classic Christmas song and take us on a journey through the 12 Days of Christmas. Learn more about the tenents of our faith through wonderful stories, meaningful activities, and create new traditions to last a lifetime. The 12 Days of Christmas is a beautiful way to finish one year, begin the next, and celebrate Christ's birth by giving our gifts to the One who has given us the greatest gift of all.